I have been sharing some recipes and cooking tips with a coworker who is just beginning his culinary journey. He gives me bento box recipes, while I try to tell him that making ramen at home is not so hard (and I am not talking about the packets that cost 10 cents!). One of his big questions recently has been about béchamel sauce. Despite my best efforts, I haven’t convinced him to try making it. 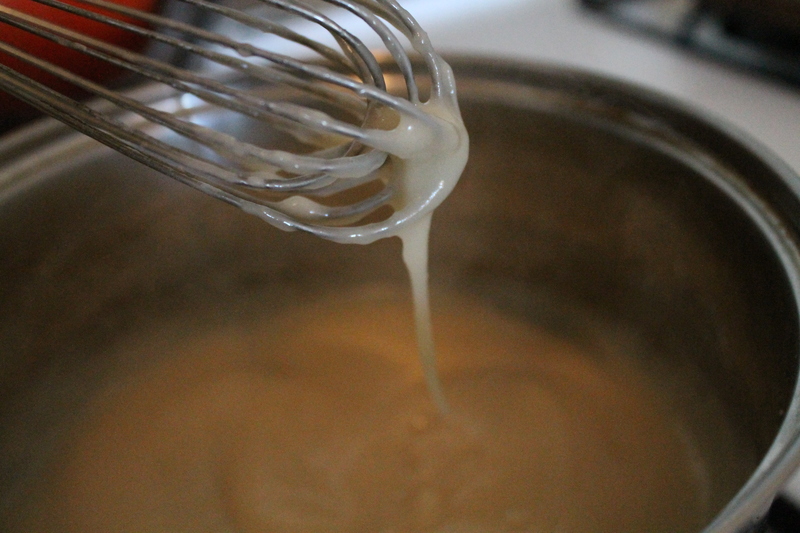 The magic about béchamel, and the other mother sauces, is that once you master the basic version, you can make any sauce. Béchamel and veloutes, both starters to the white sauces, both begin with a roux and then you add either a cream/milk or a white stock. And from there you can keep dividing, adding cheeses or curry or tomato puree. The options are seemingly endless. Each variation provides a new one to enhance a dish, even one as simple as cooked asparagus. With this in mind, I found myself contemplating what to make for dinner. One of the benefits to having an academic for a partner is that they often have time off. Thankfully this means that I can ask Justin to pick up groceries for me, so that I can get home a few minutes earlier. When I walked in the door last week, everything was set out on the counter for me: risotto, tempeh bacon, asparagus, and more Earth Balance. The beauty of this meal is that the risotto is baked. Once you have it set up, you can simply get to work on the asparagus and sauce without having to tend to a third pot. I chopped the tempeh bacon up and sauteed it briefly in a small pan. When it came time to serve dinner, I mixed it in with the risotto, and then served the asparagus with cream sauce over the risotto. Have you ever had an ear-worm that stays with you for days on end? I had that last week, only it was a food that was stuck in my mind and not a song. Souffle, my mind said. Over and over I thought about the souffle. How would I replace the egg whites? How would it rise? What flavor was best to start with? I had only ever had one non-vegan one in my life. This would be a battle of the wills. Let me start by saying there is no recipe here. After making three souffles on Sunday, I wasn’t happy with any of the results. Our kitchen looked like a test kitchen, with dishes entering and leaving the sink quickly, a lot of note-taking, and of course, many bowls with various versions of ‘egg whites’ sitting around. I knew that this would take more than one attempt. My goal was to start with the plainest option: a vanilla souffle. I thought that if I could master the portions for a plainer flavor, that the rest would come easily. The issue would be replacing the egg-whites and making sure that the souffle would rise sufficiently. Keep in mind, the original recipe calls for both 4 egg yolks and 5 egg whites. Thickened base sauce for the souffle. I missed out on all of the “2012 in Review” posts that seem obligatory when you run a blog. The end of the year came and went in a haze – the haze being my eyes glazing over while playing Civilization on my computer a little bit too long. It was a welcome break after a hectic end of the year. Between being out of work for almost a week due to that food poisoning (or what I now think was that) and trying to wrap up everything before the office close, I was looking forward to some time to unplug. After the initial vegetable phase of being on break, I started cooking. I baked tarts to share with friends and family, made faux-Indian food, and drank a lot of cider. In between, I ran errands with my husband (a term that I am still getting used to). I don’t know if it was the changing of the calendar that prompted this, or just the fact that we finally had more than two days with each other, but we spent a lot of time talking about our plans as a couple and individually. There is an inherent magic to the calendar year changing. The way that the trees blossoming and later the leaves falling causes wonder, the change from one year to the next lends itself to making resolutions and cleaning. For as many people who make resolutions, there are just as many who say they are not a fan of resolutions. I am normally a part of the latter group. Yet this year, I find myself drawn to making some resolutions. The main item that I was responsible for was the bigos, which I wrote about earlier. The other cooking I took upon myself was to bake a tart – one for Christmas Eve dinner with my family, the other for Christmas Day dinner with friends. I pulled both recipes in their entirety from SmittenKitchen (fittingly, I received Deb Perelman’s book as a gift for the holiday) as her recipes have always been successful for me. I could have easily called this blog “What’s Polish Cooking Without the Kielbasa?”, but I didn’t realize how much time I would actually spend trying to recreate family recipes. Some of them are fairly easy – nalesniki (or crepes as most people know them), pierogi (stuffed with mushrooms and sauerkraut instead of the usual potatoes and cheese), and borscht. Those are the easy things to make vegan. A whole package of Tofurkey Kielbasa is A LOT of kielbasa! There is a whole area of Polish cooking that I have steered clear of, mostly out of an inability to make them vegan-friendly. Unfortunately my interest in cooking didn’t really start until I had already moved out of my parents’ house. When the holidays would come around, my mom accommodated my vegan diet – making sure that there were dumplings, soup, and other options for me to eat. I only participated in the cooking when it came time to form the pierogi – my favorite task in the kitchen. The cabbage question hasn’t fully been answered yet. Partly because we had fallen behind, but also because we were being delivered kimchee on a regular basis by my brother and sister-in-law. So not only have we been trying to our own cabbage, but also theirs! This overabundance of cabbage has led to some culinary frustration. I resorted to harassing my mom via email. Her responses were not the quickest, but she was very adamant that I cook the cabbage and then season it as I want later. Every time I would suggest something new – cabbage soup, stuffed cabbage, stew, her response was the same. When I asked about sauerkraut, I could feel her starting to get annoyed. Sauerkraut takes 3 weeks to ferment. My plan of turning our fresh cabbage into sauerkraut to be used for bigos in a week was trashed. I did what any sane person would do. I ignored her suggestions and started to search my cookbooks, but it seems that cabbage is a neglected ingredient. Can someone else stir for a minute? I didn’t even really know what lemon curd was until I actually made it today. Sure, I’ve seen it in the grocery store and always wondered what it was doing there, tucked amongst the various jellies and jams. When it came time to decide what to bring to work as a holiday gift, I scoured the internet trying to find something gluten-free and also appropriate for the holidays. What is lemon curd? It’s a fruit spread made with egg yolk, sugar, and butter. They became popular during the late 19th century in England, where they were served during afternoon tea. The downside to fruit curds is that they don’t last as long as a jam or jelly would. You can use them simply on toast or on a scone, but they can also be eaten with yogurt or dessert (such as cake). Since they are made with only egg yolks, be prepared to have some leftover egg whites. I’m hoping to make some chocolate-coconut macaroons with mine. I don’t have ready access to Meyer lemons, so a jar of cured lemons was out of the question and I didn’t want to be messing around with a candy thermometer either. The last time I used one was when I nearly destroyed a baking tray making caramels.